Some may find it a bit weird to try solar Christmas lights, but once you finish your shopping gift list you come to realize that you may want some bit of help for your electricity bill. After all, it’s time to be all-jolly and not down from all of that spending! 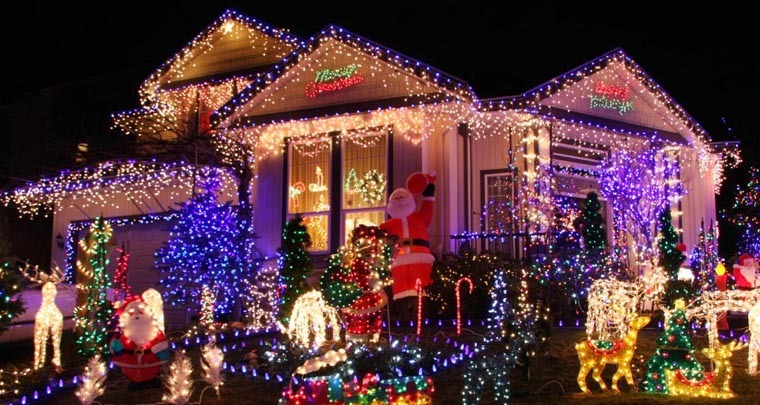 Why use solar Christmas lights? Well, first of all, these types of lights do have a big say on your electricity bill and who doesn’t want to spare every single buck for more gifts on Xmas? Apart from this, solar lights are so easy to install and to use, which is also a big plus. You don’t need any wiring or tools for it; you just need to pay attention where you install them. You do want the solar panels of the lights to get the best sunlight exposure throughout the day. You do need solar lights that are built to take a bit of snow and some cold weather so weatherproof build is important. The solar panels should be larger so they charge faster and easier and the batteries should hold their charge for more than just a few hours. When you get solar lights for Christmas looks should also count a lot so maybe we should have started with this one. Let’s not forget the versatility of the lights though as the more you can get creative with them, the prettier your Xmas will be! 1). 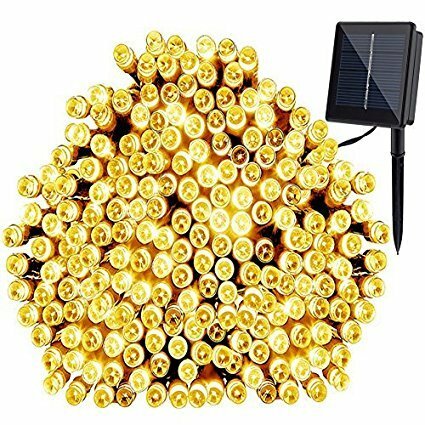 Bring some elegant vibe into your Christmas with just a few bucks with the Vmanoo Christmas Decorative Solar Powered Lights, 30 LED 19.7ft 8 Modes Water Drop Fairy String light. The solar powered lights use efficient solar panels, lowering your electricity bill for the winter holidays. The built-in battery is durable and may run for even 12 hours on a 6 hours charge for the solar panel. The lights are very easy to install and to use, presenting a power switch and mode switch as well. You may choose one of the 8 modes, giving you the opportunity to create a different vibe every time. The modes are various and fun to use waves, sequential, slow fade, Slo-Glo, twinkle/flash, and steady on, chasing/flash and combination. The build is good and the lights are water resistant, which is great for the wintertime. The design of the lights is special and the teardrop shape looks nice on any tree or outdoor space. Additionally, the bulbs are variously colored, adding more colors to your outdoors. The lights look so nice even from a distance and are highly versatile. The solar panel charges even on a cloudy day and the lights are worth every single buck. Nevertheless, considering the very low price, the lights sure look nice and bring a colorful vibe on your Christmas. 2). Create a warm atmosphere for Christmas with the Solar String Lights 72ft 200 LED Fairy String Lights. The 72ft. lights feature 200 beads and are easy to wrap around trees, lining steps or railings, giving a nice, warm light. The build of the lights is good and they are waterproof, presenting an IP65 grade. You may confidently use them indoors and outdoors. The solar panel is efficient and charges fast, whereas the double premium battery needs around 6-8hours for charging. During the summertime, the lights may run for even 15hours. The lights are easy to install and the flexible, long cable gives you the chance to get very creative when installing them. The light is warm white and you may use two operating modes: steady-on and blinking mode. The on/off mode saves more energy and the automated-on feature at dusk means the lights turn on automatically when dusk has come. The pointed stake of the solar panel provides good stability and its movable arm is a nice detail. Warm, flexible and easy to use, the lights are a great Santa’s little helper. All in all, for the little money you pay, the lights are a great buy for your Christmas. 3). It ain’t real Christmas if it’s not colorful and joyful, is it? 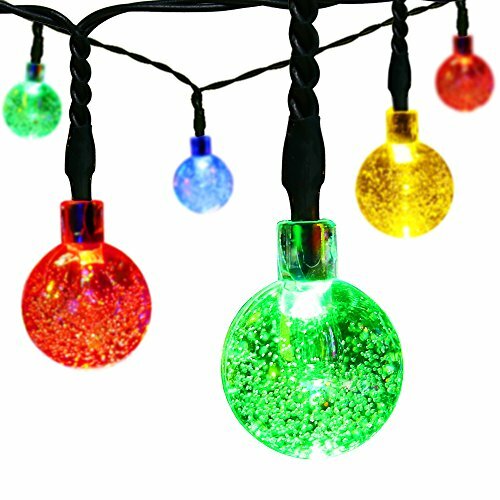 Let the fun come into your garden and give it a go with the easy Decor Globe Solar String Lights 30 LED 21ft 8 Mode Bubble Crystal Ball Christmas Lights. The lights come with colorful LEDs and manage to create a fun, colorful atmosphere anywhere. They are highly versatile and you may use 8 modes with Memory Function. The versatility doesn’t stop here and you may wall-mount or stick the solar panel into the ground-whatever fits better your needs. The solar panel on the lights charges well and only needs 5 hours charge so that the lights run 8 hours. The build of the lights recommends them for the outdoors and the IP65 waterproof grade help the lights take the snow. The lights turn on automatically at dusk and off in the daytime. Each LED is a set color and the memory function means the lights remain on a specific mode. The lights look nice and light up very well a wide area. The multiple settings allow you to get various effects. Well-made and bright, the lights aren’t to be missed when shopping for next Xmas. Despite the minor issues, for the colorful light and several modes, the lights sure can create a fun, colorful Christmas. 4). Christmas lights don’t have to be all about string lights and you may also use some spotlights to bring up the winter holiday spirit into your yard. 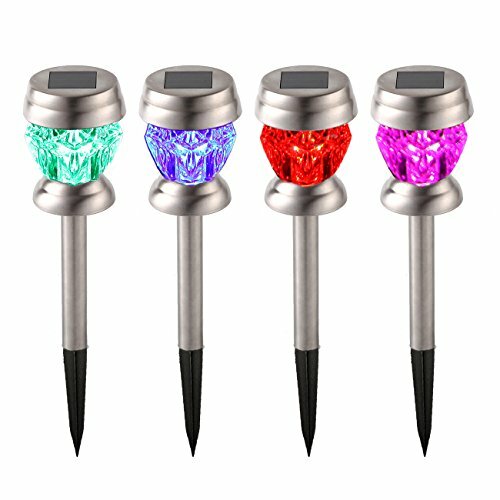 Don’t hesitate to give it a go with the AMIR Solar Spotlight Outdoor, 180°Adjustable Auto On/Off that are able to create nice, colorful effects in your backyard. The lights present auto changing color modes so you don’t have to control the light. You may use the low or the high light mode and the maximum 200 lumens output sure bright up any Christmas. The 180-degree adjustable light means you may set the light angle to illuminate the right way a designated spot. However, you may also adjust the solar panel angle so that it gets the best sunlight exposure. The lights also include automated switch so you don’t have to turn them on/off. You may wall-mount or stick it in the ground, just the way you want and need. The build of the lights ensures use for long time and the lights are IP65 waterproof graded, being safely to use on a rainy day. The Li rechargeable battery is durable and may light up for even 10 hours, on a full charge. It’s easy to set up and to use the lights. They work well and are bright. The low setting gives nice light and the lights are sturdy. The colored, bright light is nice and the spotlights are dependable. Despite the minor issues, for the nice, bright light and colorful vibe, you should count on the spotlights for your next winter holidays. 5). Bring the winter holiday spirit into your pathways with the fun GIGALUMI Solar Lights Outdoor Dual Led Garden Light Landscape. The dual LED solar lights let you choose the white or the color changing led so you may get various Xmas vibes. You may go for the elegant, subtle white atmosphere or try the fun, colorful one. One thing we really like about the lights is the diamond lens that gives such a nice lighting effect. The stainless steel construction is made for the outdoors, whereas the lower skirt part makes the lights stand out from the crowd. The lights turn on automatically in the evening and turn off the same way in the morning. They are very easy to put together and to use. The spikes are also heavy-duty and slide easily into the ground. The switch to go from white to color is hidden and well protected by housing. Not only the build is good, but also the design which is well thought out, therefore. The lights are waterproof and the risk for overheating is minor. The romantic, changing lights are great for the Christmas and all year round, use and the lights don’t disappoint. For what it’s worth, the lights sure can bring a nice, colorful feel to your pathways, Christmas or not. 6). 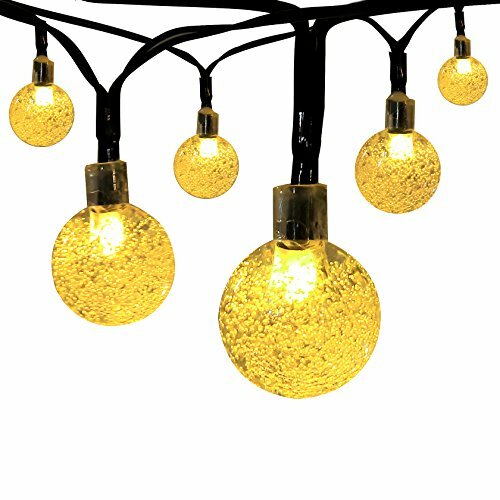 You may have to take the Innoo Tech Solar Globe String Lights Outdoor with a pitch of sault as the lights are a fun, pretty way to brighten up your Xmas, but some may find them too small for that. The lights may run for even 10 hours after a 6-8hours charge and make a nice impression on any decorated area. The water resistant build of the lights recommends them for the outdoor use, whereas the automated on/off feature sustains an easy use. The lights come with two switch for easier operation and one solid stake. The solar panel is adjustable so it may get the best sunlight exposure in summer and winter. The Ni-Mh rechargeable battery charges during the day and lights up automatically at night. The lights look pretty and are well made. The build is pretty solid and the lights create a warm, elegant feel for your Christmas. Regardless, for the elegant looks and the warm light, you’re not making a terrible mistake when getting the lights. 7). If you’re going for the traditional, string lights that make such a great impression, put your trust and faith in some lights like the LED Waterproof String Lights with Steady on / Flash 8 Modes. We like not only the versatility of the lights (you may use them on Halloween, not only for Christmas), but also the several lighting modes and the good build. 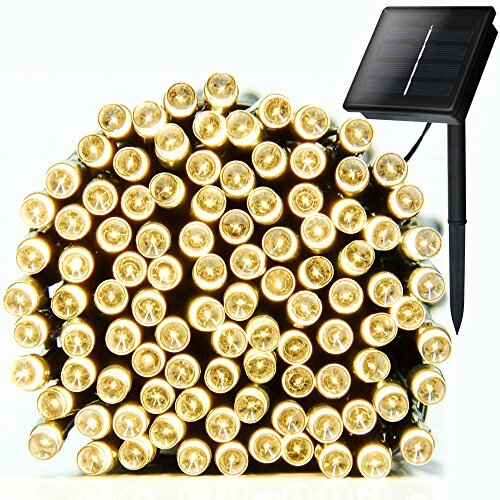 The solar-powered lights are safe and reliable to use and they may run for even 12 hours, if battery is fully charged. The versatility of the lights is great and you may go for the showcase or the window displays and use them for your home or your business decoration. You may use one of the 8 lighting modes so you can get various feels during the holiday seasons: waves, sequential, Slo-Glo, slow fade, steady on, twinkle/flash, chasing/flash and combination. You may install the lights in many places, from wall to windows, branches, roof and so on. They automatically turn on/off in the evening/morning. The string lights include 300 LEDs and the wire is 100ft. long. This means you can get pretty creative when decorating your outdoors. The solar panel may need around 4-6hours to charge so that it may ensure 6-10hours of run. If you’re using the flash mode, the lights may run even for 12 hours. The build of the lights is sure another good thing as they are waterproof, with minimal risk for overheating. The heat emission is low and the lights don’t get hot even after many hours of use. The stake is made with solid plastic and the wire doesn’t have a flimsy feel. Versatile, well-made and giving so many lighting modes, the lights are great to try on different holidays. For the versatility and various lighting modes, the lights are a sure buy for all year holidays, not only for Xmas. 8). 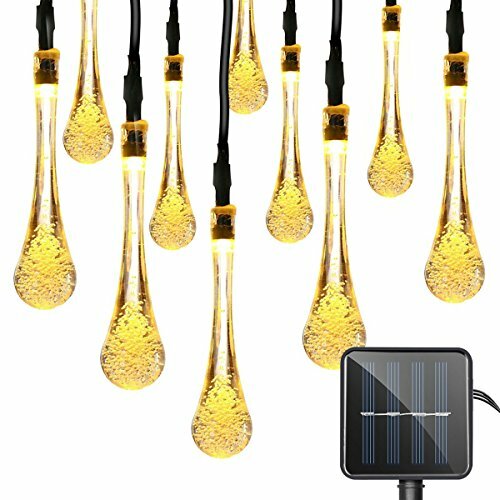 For those of you looking to have a warm glowing Xmas, a reliable option would be the G-DEALER Solar String Lights 72ft 200 LED 8 Modes Solar White. The 72ft. long, LED solar string features 200 LEDs and creates a beautiful, fairy lighting effect. Not only the light is nice, but also the use is safe as the lights are waterproof. Add the 8 modes of lighting effects (sequential, Chasing/Flash, Slow fade, Waves, combination, twinkle/flash and steady on) and you get lights that work for so many areas: patio, yard, garden, and so on. The lights also features two switches so you may control the lighting modes (flashing mode convert switch) and the power (on/off). Once the switch is on, the lights automatically charge during the day. The solar powered panel has a long spike that gives nice stability. It ensures all night long run for the lights if it’s fully charged. The cable is a blackish green so it mingles very nicely into any outdoor area. The lights have a good build and are waterproof. The lights are easy to hang and easy to store when not in use. They are small and simple, but create a romantic, glowing feel. As long as you’re in for a warm, romantically glowing Xmas, you’re good to go with the lights. 9). 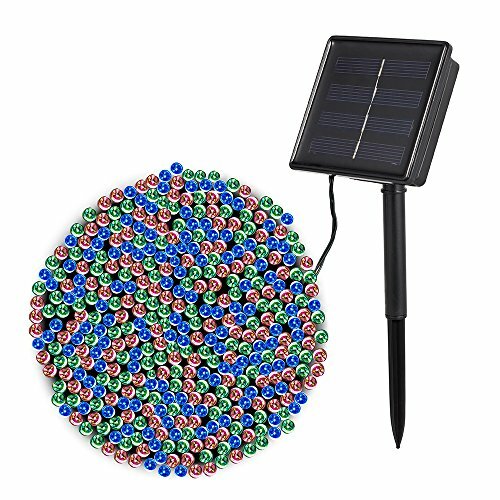 Pretty and bright, the Solar String Lights (72 ft., 200 LED, Waterproof, and 8 Modes) may be the final detail you needed for your Xmas decorations. The outdoor string lights automatically turn on when it gets dark and the light turns off the very same way when the sun is rising. We really like the lights for their cool settings and you may use 8 lighting modes, from steady colors to various flashing. This means you can’t get bored with the looks of your outdoors during the Jolly season. The build of the lights doesn’t disappoint and the lights have a durability feel. They bend easily as they’re made with bendable copper and the 72ft. length lets you get creative when installing the lights. You may experiment various shapes, as the copper line is durable and easy to bend. Additionally, the lights are waterproof so it’s safe to use them outdoors. They provide a 360-degree viewing angle and the 200 LEDs illuminate nicely any designated area. Tiny, yet bright and standing out in any scenery, the lights are well made and so easy to bend for creative installation. Nevertheless, for the durable, bendable line and cute looks, the lights are worth to try next Xmas. 10). Looking for the colorful, traditional Christmas look for your garden? 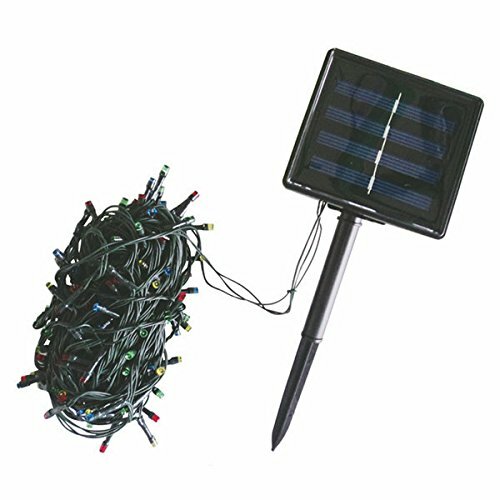 Put your money at stake with some reliable lights like the BSV-SL200 Christmas Decorative Solar Light String Solar Christmas Light String. The lights are well made and so easy to decorate with. You may use them for your courtyard, window, shop or venue. They are solar powered and cost efficient. The solar panel is effective and charges well during the day as it has a good size. The battery holds the charge so the lights run all night long. The lights come with light control technology so they turn on automatically in the evening. They also turn off the same way in the morning. It’s very easy to install the lights; you only need some creativity and patience as they may tangle. They are waterproof so it’s safe the use them on rainy days. The light is warm and the lights present 8 kinds of lights, including flashing mode. The LED lights are blue, warm white, white and the wire is 55ft. The stake is pointed and provides good stability for the solar panel. It has a rugged build and so do the lights. Despite the minor drawbacks, we still like the lights for the various modes, good build and nice light they give each Xmas.